Herno Laminar is a premium Italian outerwear collection made in collaboration with Gore®, a brand renowned for durable waterproof, windproof and breathable designs. Borrowing textiles from active sportswear, the Laminar collection is designed to meet the demands of daily life whilst offering a high level of performance. 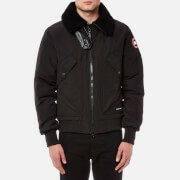 Made with a high performance 3-layer GORE-TEX® shell, the men’s ‘Impact’ hooded bomber jacket is cut for a slim fit and offers complete waterproof, windproof and breathable protection from the elements. The down jacket is tear-resistant thanks to the ripstop technology and its specific inner knit which features heat-sealing rather than traditional seams. 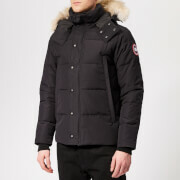 The quilted jacket is injected with goose down and feather padding for warmth in cold winter conditions. A two-way zip fastening with a polyurethane coating and interior thermo taping ensures the jacket stays completely waterproof. The jacket has two side pockets and napoleon chest pocket with polyurethane-coated zip fastenings for waterproof protection. 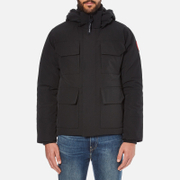 Complete with a fixed hood and windproof cuffs in a technical knit fabric. Main Fabric: 100% Polyamide. Membrane: Polytetrafluoroethylene. Trim: 72% Polyamide, 28% Elastane. Padding: 90% Down, 10% Feather. Main Fabric: 100% Polyamide. Membrane: Polytetrafluoroethylene. Padding: 90% Down, 10% Feather.